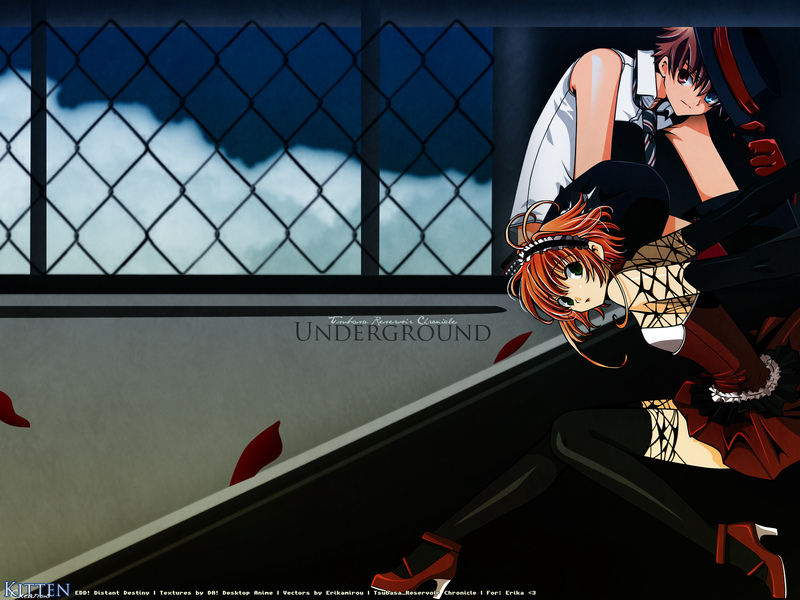 Tsubasa Reservoir Chronicle Wallpaper: UnderGround. Minitokyo »	Tsubasa Reservoir Chronicle Wallpapers » Tsubasa Reservoir Chronicle Wallpaper: UnderGround. I won't thanks to chloe telling me not to. The background is nice, there is just one part i think it needs a little more work. The Fence need on the upper end some more work and the vertical posts. They don't match somehow. The rest is made really good. Great job on the vectors, Erika! I'm having this huge problem trying to understand how the background goes. But well, the overall thing is wonderful. Love how you arrange the vectors. The only weird thing is that the petals are waay too big. The petals and fence-holes seem quite large compared to the characters, but things like that don't really bother me. This is awesome Kitten! I love how you used Erika's vectors, they look great! Sakura angled that way looks great! <3 Nice work! Wow this look soo cool!This colours are so mysterious,i love this background. Simply it is very beautiful! kewl! as expected from you! It's very dark but adorable. I love this scan. The colors are all so vibrant but dark and I just love the style here (just like how that Infinity City is. I so want to live there!) Oh, but if I may, I'd like to comment on just one teensy thing in this picture. Syaoran's brown eye and his recently claimed blue eye are mixed up. Just a small mistake, I'm sure, really nothing to worry about, but all the same... Anyway, I really like this. woah. Cute. I like syaoran's mismatched eyes.